Product #15625 | SKU MB_L39-M-28/90 | 0.0 (no ratings yet) Thanks for your rating! Made of Brass, Precision-Machined & Plated with Chromium. 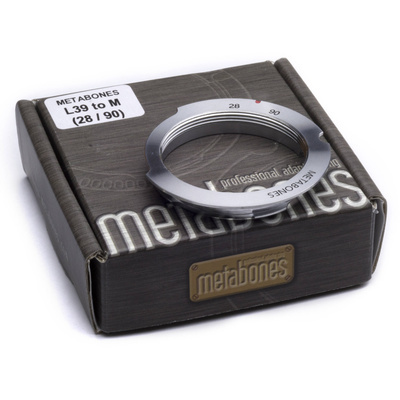 The L39 Mount Lens 28-90mm to Leica M Camera 6-Bit Lens Mount Adapter from Metabones allows an L39 Mount 28-90 mm lens to be attached to Leica M cameras. The appropriate 28-90 mm rangefinder frame lines are activated by the adapter. Metabones adapters are quality made, using precision-machined brass with chromium plating on both the camera-body and the lens sides of the adapter in order to ensure smooth mounting, quality aesthetic, and durability. Activates 28-90 mm frame lines in the viewfinder.